Combine gardening, graphic design, and geography and what do you get? The State Flower Collection print by artist Kristen Ley. 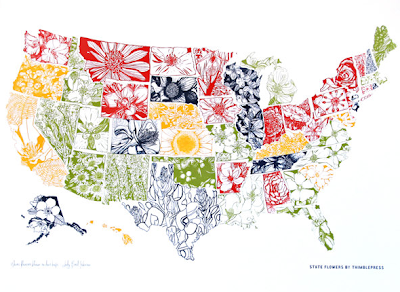 Inspired by the wildflowers of Texas and a quote from Lady Bird Johnson, "Where flowers bloom so does hope", Ley created the illustrations herself and used the colors form the State flowers themselves to define the colors of the images.